Task Description: Assessment task three requires the preparation of a full project proposal that should not exceed 3000 words excluding the cover page and reference list. Problem Statement - students need to provide a detailed statement of the problem you would like to investigate. Research Project Justification and Potential Outputs - students need to explain why your chosen project is important both theoretically and practically? What are the potential outputs and outcomes of your research? The Conceptual Framework - students need to provide an analysis of the literature relevant to the research project that leads to the development of a conceptual framework for conducting the research. Methodology - based on the conceptual framework, research aim and research objectives, students need to provide a detailed description of the data collection methods, tools and data sources that will be used to analyse the data. Research Project Organisation, Budget and Schedule - students need to present all components of the research report by writing the names of the chapters/sections and briefly discussing what will be written in each of those chapters/sections followed by a brief description of the budget and project schedule. 1.0 Background of the subject: There is an extensive amount of competition that exists among various smartphone companies and who also tend to come up with different kind of innovation strategies from time to time. The companies Apple and Samsung have been chosen because Samsung is a South Korean based company that entered the host nation USA. Also, they challenged the market leader to become one of the most sought after telephone company with more than billions of population showcasing their support to them (Cecere, Corrocher & Battaglia, 2015). Here, the city Cupertino was the most affected one. Also, Samsung has extended their product portfolio to launch electronic appliances that are highly used at home, implying that they are not going to stop at challenging just Apple but will go on to perform much better and in a far more convenient manner than the other existing companies in Cupertino, USA. The hunger for world dominance from the side of Samsung has subsequently led to the understanding that the company has created problems for the other competitors. 1.1 Problem Statement: Samsung challenged the basics and fundamentality of then market leader Apple that it led to their sales decline and eventually allowed Samsung to take over the top position. The competition between the two has led to the decline of business operations of other smartphone companies and are struggling to make some financial gain (Paik & Zhu, 2016). Also, USA has not been able to gain enough financial outcome from the smartphone industry. Also, Cupertino has been subjected to numerous adversities due to the existence of the majority of the USA based smartphone companies. 1.2 Research Aims and Objectives: This research aims to identify if the competition between Apple and Samsung has decreased the values of other smartphone companies in the USA and have led to the financial decline, with less contribution to the country’s economy. The research also intends to identify the situation of Cupertino regarding financial decline and other losses. What are the differences between the business operations conducted by Apple and Samsung? What strategies allowed Samsung to take over Apple as the market leader? How have the competition between these two companies been affecting other smartphone companies? Do these smartphone companies have a major contribution to make in the growth and development of the country and in the city of Cupertino? What are the key smartphone preferences of the population of Cupertino? 1.4 Project Justification: This is one of those subject matters that is barely considered important by multiple researchers. Thus, there would be instances where relevant resources would be difficult to generate for a proper guidance for the study. Also, due to the absence of many secondary sources associated with the technological innovation or development at Cupertino. This is one of the reasons why the use of primary method has been fostered in the study. In addition, the internal decline and other features often go unnoticed in majority of other researches and thus, this research would benefit in this area. 1.5 Possible Research Outcomes: The use of appropriate literature and methods would make sure that accurate results have been developed and that it would be evident to understand about why the companies have been facing a decline in their recent performance in the USA and specifically in Cupertino. H1: Strategies that had allowed Samsung for taking over Apple to be the market leader? 2.2 Existing Evidence : Given below are the list of journals and articles that justify the relevancy of the problem statement and those articles have been further used to conduct the review on in a much more proliferated manner. Rani, H. M. N. S., Zuber, F., Yusoof, M., Zamziba, M., & Toriry, S.
The table above clearly depicts the kind of research that has been to make sure that a viable problem statement has been developed. The journals cover the impact of the extent of competition among the smartphones companies and how they have hampered the essence and functioning of the other companies. 2.3 International Strategy of Samsung: One of the reasons why the company has managed to more prominence in the domestic market is due to the idea that they have an effective team that has managed to understand the importance of international strategy and how it allows an organization to gain a competitive edge in the market. Also, it has been remarked that the company has made proper utilization of the cross-cultural aspects that have made sure of them to apply viable measures in gaining prominence in the market. Further, their international strategy of providing convenience and easy access to their products have further managed to acquire the attention of the people. According to Jia & Yin (2015), they comply with the idea of having nationwide merchant and retail nearness for sturdiness in the business sector while Apple makes sure that they continue to follow their path of technological innovation blindly. The company has also initiated aspects that they manage to monetize data with analytics, allowing them to gain a significant amount of dominance in this particular aspect. As stated by Seo (2016, pg. 3), the pursuit of the idea of market integration has allowed the Korean company to gain such kind of prominence in the international mobile industry. Also, here the key focus is one four essential policies, from which the synergy effect is highly considered and is being utilized by Samsung. Samsung Electronics (SE) continues to be one of the prominent success of the entire group. The international implantation of SE is mainly addressed as a location advantage. Their geographical consideration makes sure that they have managed to gain enough amount of prominence in the market. The convenience of their location allows them to gain access to the customers, notice them evidently and gain valid range of information regarding their product preferences (Siddiqui & Mishra, 2016, pg.402). Since, one of the essential aspects was to encourage the idea of internal discussion, so the organization made sure that enough attention has been paid in the better and quicker policy implementation, it allows them to adapt themselves to the culture of the host nation and work accordingly (Rani et al., 2016, pg. 609). Also, their risk-taking attitude and primary focus on human resources make sure that they have managed to ensure their permanent presence in the majority of the countries. The extent of competition and innovation has given birth to the idea of a dominant design, implying that there would only be one particular product that would rule the preferences of the people. A product is being accepted by a bulk population only when they have managed to initiate the idea of product variants and have an innovative architecture introduced from time, similar to Apple (Cecere, Corrocher & Battaglia, 2015, pg. 163). 2.4 Business Operations and Domestic Strategy of Apple: According to Zhang (2017, pg. 40), the primary focus of the company in the recent scenario, is in their products and their marketing strategy. Also, it has been countered that their focus on the idea of innovation should not be shifted and they must ensure their capability to introduce new concepts every year and maintain the expectations of the population. According to Narayana & Dr. Ramu (2018, pg. 3804), their ability to maintain the interests of the employees have allowed them to gain prominence in the market and maintain a competitive edge with facilities like medical coverage, extra security, transportation help and many others. The idea of competing values framework and the necessity to incorporate the idea of better, formal and structured stability of the organization, the influence of the external environment would eventually lead to a development of the internal environment, allowing to understand the customers in a more significant manner. According to Payne (2017, pg. 53), the application of Quantum strategy by Apple allows them to operate in a competitive and in a more sophisticated manner in this industry. This can be considered as the drivers of their intentions and business processes. Their application of Quantum strategy mainly results in success due to their special attention towards innovation capability, deep collaboration approach and presenting an image of maverick creativity in their branding. According to Payne (2017, pg. 53), they also have the tendency to make sure that they can influence the perceptual interpretation of the consumers as they will mostly judge the product based on their appealing quality. As stated by Khan, Alam & Alam (2015, pg. 960), the company has been well known to position itself against the various industry forces that allows them to maintain stability in their business operations. With the bargaining power of the suppliers and the customers as low, it is evident that the organization has very fewer aspects to worry about in their business operations, other than the extent of competitiveness being too great. Even though Apple has managed to maintain their competitive positioning in the USA market, but the situation of Cupertino has not been considered favorable, due to the extensive use of Samsung products over them. 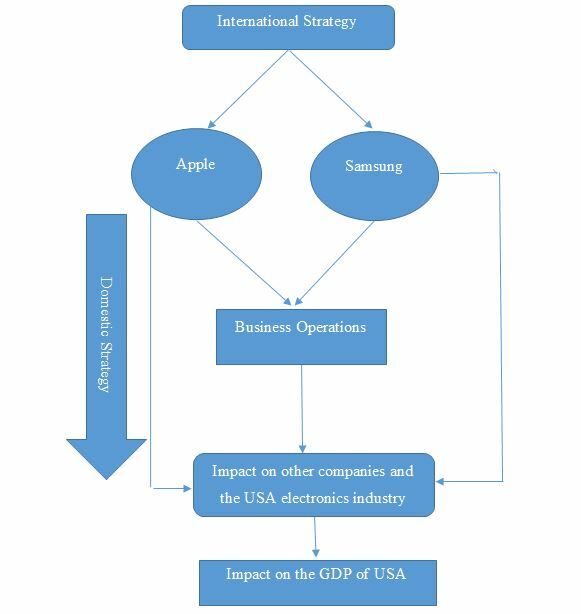 2.5 Contribution of the electronics industry in the economy of USA: From the side of Samsung, even this company is contributing a significant portion in the GDP by being a part of the FDI, but the focus on transactional approaches, relational, digital and hybrid approaches have been highly considered by majority of the companies (Watson et al., 2018, pg. 34). However, as stated by Jung, Hur & Kim (2015, pg. 438), the ability to understand the demands of the American customers with the fusion of the Korean cultural aspect, Samsung was much more acclaimed than Apple. Also, that the taste of the customers is mainly heterogeneous for their willingness to pay money for the quality. This is one of the reasons why people of Cupertino are more inclined towards Samsung Products than Apple. It might be addressed as a complex notion, but it also provides a potential for a substantial amount of growth. As stated by Lorentz et al., (2016, pg. 220), the US technology industry is facing a downfall regarding their business operations and have been considered to lack enough amount of creativity in their services. Many have also claimed that America’s favorite Apple has also failed to launch or administer enough amount of creativity in their products that would make the customers retain their loyalty for their company. As of 2015, the consumer electronics sector made about 5.2% of contribution in the GDP of the country, while provided 4.7 million jobs to the people. It is mainly the innovation aspect of an organization that makes a major contribution to the effective business operations of an organization. According to Babkin, Lipatnikov & Muraveva (2015, pg. 751), the idea of innovative activity of various organisations differ from one another and that the R & D and IT department plays an integral role in ensuring quality with innovation. Also, the extent of quality development has led to the birth of the idea of royalty. It implies that since Apple phones are much more expensive than the Samsung ones, so anyone using them would be declared a part of the royalty yield (Galteovic, Haber & Zaretzki, 2017, pg. 1536). 2.5 Performance of the other prominent companies: As stated by Miller et al., (2016, pg. 5711), the extent of competition has been shifting to the idea of High end, and there has been an extensive amount of growth in the level of competition in this particular industry. Thus, the idea of sustainable operations would always be proliferated in a manner that it provides the company with an opportunity to earn enough amount of profit and mainly focus on considering the aspect of minimizing waste. It has also been identified that even though companies such as Huawei, HTC, and Sony are maintaining their level of competition in the market. However, they have failed to understand the various implications that come with the idea of making sure that the companies need to include enough amount of product variety and make sure that their product portfolio is enough to attract the attention of the consumers. The US smartphone industry is dissolving into Apple-Samsung hegemony. Due to the performance issues of the majority of the companies, they have initiated the idea of mergers and acquisition with the domestic companies such as T-Mobile, Sprint and many others. However, the companies are not even gaining success in striking a deal with these companies. Among the majority of the consumer preferences, Samsung and Apple continue to occupy the top position here. According to Bhaumik, Driffield & Zhou (2016, pg. 4), it is not just the Korean companies, but the Chinese mobile companies have also grown to be a threat for the operations of the domestic companies of USA and by focusing extremely on scale economies. Also, 70% of the smartphone sales are being occupied by Samsung and Apple, leaving behind minimum opportunities for other companies such as LG, HTC, Sony or Huawei. It has also been suspected that the consumers would not even bother to ask about companies like Sony or LG within a few years. According to Meyer & Katz (2016, pg. 370), a proper analysis of the sustainable measures undertaken by the organization also allows in the better understanding of the prominent concept associated with ‘environmentally preferable products’ initiated by the consumers. Here, the idea of brand identity also plays an integral role in identifying if an organization has been able to gain the attention of the consumers. According to Zhang (2015, pg. 60), it has been stated that the idea of brand equity develops from the confidence of the people on the brand and the greater the confidence, the higher price they pay for the brand. It includes the popularity of Samsung’s Galaxy series and Apple’s iPhone series. 2.6 Challenges faced by the domestic companies against the foreign ones: According to Tulung (2017, pg. 162), the smartphone industry has initiated the new era of technology and have made sure that the people have been able to understand the kind of crisis that the international companies create for the domestic ones. Also, their choice of entry mode has also a significant amount of impact on their choices, and they also focus on a complete affiliation from the beginning but with the development of other internal aspects such as HR, recruitment, and others. In the current scenario, USA is facing a heavy amount of competition from the side of China and South Korea. Their ability to provide cheap smartphones at a much cheaper rate is posing as a significant challenge for the company and other domestic manufacturers as well. As stated by Cortez et al., (2015, pg. 176), the extensive amount of competition and innovation in the technology industry creates a fierce rivalry, but at the same time, incorporates the idea of proper use of resource advantage, to make sure that a proper financial performance can be ensured. 3.0 Research Design and Approach: For the study, the researcher has proposed the use of ‘exploratory research design’ (Creswell & Creswell, 2017). It would allow the researcher to conduct the study in a more proliferated manner and discover the depths of the problem faced by the smartphone companies stuck between the competition of Apple and Samsung. The use of mixed methodology has been initiated by the researcher to make sure that the use of both quantitative and qualitative method provides viable and relevant results to the researcher for the study. The use of ‘deductive research approach’ has been initiated to make sure that the use of deductive reasoning would allow the researcher in using a viable conclusion from the study and make sure that there is a logical reply to the kind of questions that have been developed at the initial stage of the study (Sekaran & Bougie, 2016). The researcher has proposed the use of ‘positivism research philosophy’ to make sure that the idea of interpreted experience and logic has been used and that the idea of misleading information is completely avoided in this context (Hughes & Sharrock, 2016). 3.1 Data Collection Method and Sampling : For this study, the researcher has proposed the use of the primary data collection method as it will allow in a better and detailed understanding of the subject matter and would also in collecting first-hand data, that would be true to its nature and would present with less possibility of misinterpretation (Thuries & Gillet, 2016). For the quantitative data collection method, a survey would be conducted among people residing in Cupertino and mostly questioning them about the smartphone choices they make and generating reasons behind them (Glaser & Strauss, 2017). For generating qualitative data, an interview would be conducted of two managers belonging to organizations named Sprint and T-Mobile. Regarding sampling, the use of both probability and non-probability sampling would be initiated, and for quantitative data collection method, the use of simple probability sampling would be initiated, and 150 people would be randomly chosen for the survey. The data generated would allow in conducting comparison with the secondary sources of data identified. For the qualitative data collection method, the use of purposive sampling would be initiated. 3.2 Data Analysis Method: The use of graphical analysis would be used to make sure that viable conclusions can be drawn and the responses of the participants can be accurately presented to the people and make sure that the research questions have been properly answered (Ott & Longnecker, 2015). The use of qualitative reasoning would be used as well to draw a viable conclusion from the interview that would be conducted. It would allow in the formation of a coherent opinion on the subject. 3.3 Ethical Consideration: Ethical consideration is one of the integral aspects of research. The researcher would make sure that the information collected is not misinterpreted in the study at any cost and that the people participating in the study have provided their consent. There should not be any involvement of unethical questions from the side of the research, and he/she has to make sure that the sentiments of the population are not hurt. For gaining access to paid journal articles and make sure that a substantial amount of books has been selected as well. Babkin, A. V., Lipatnikov, V. S., & Muraveva, S. V. (2015). Assessing the impact of innovation strategies and R&D costs on the performance of IT companies. Procedia-Social and Behavioral Sciences, 207, 749-758.Fan, Y., & Yang, C. (2016). Competition, product proliferation and welfare: A study of the us smartphone market. Bhaumik, S. K., Driffield, N., & Zhou, Y. (2016). Country specific advantage, firm specific advantage and multinationality–Sources of competitive advantage in emerging markets: Evidence from the electronics industry in China. International Business Review, 25(1), 165-176. Cecere, G., Corrocher, N., & Battaglia, R. D. (2015). Innovation and competition in the smartphone industry: Is there a dominant design?. Telecommunications Policy, 39(3-4), 162-175. Cortez, M. A. A., Ikram, M. I. N., Nyuyen, T. T., & Pravini, W. P. (2015). Innovation and financial performance of electronics companies: A cross-country comparison. Journal of International Business Research, 14(1), 166-179. Galteovic, A., Haber, S., & Zaretzki, L. (2017). Is There an Anticommons Tragedy in the World Smartphone Industry. Berkeley Tech. LJ, 32, 1527. Glaser, B. G., & Strauss, A. L. (2017). Theoretical sampling. In Sociological methods (pp. 105-114). Routledge. Hughes, J. A., & Sharrock, W. W. (2016). The philosophy of social research. Routledge. Jia, J., & Yin, Y. (2015). Analysis of Nokia’s decline from marketing perspective. Open Journal of Business and Management, 3(04), 446. Jung, C. M., Hur, W. M., & Kim, Y. (2015). A comparison study of smartphone acceptance between Korea and the USA. International Journal of Mobile Communications, 13(4), 433-453. Khan, U. A., Alam, M. N., & Alam, S. (2015). A critical analysis of internal and external environment of Apple Inc. International Journal of Economics, Commerce and Management, 3(6), 955-961. Lorentz, A., Ciarli, T., Savona, M., & Valente, M. (2016). The effect of demand-driven structural transformations on growth and technological change. Journal of Evolutionary Economics, 26(1), 219-246. Meyer, D. E., & Katz, J. P. (2016). Analyzing the environmental impacts of laptop enclosures using screening-level life cycle assessment to support sustainable consumer electronics. Journal of Cleaner Production, 112, 369-383. Miller, T. R., Duan, H., Gregory, J., Kahhat, R., & Kirchain, R. (2016). Quantifying domestic used electronics flows using a combination of material flow methodologies: A US case study. Environmental science & technology, 50(11), 5711-5719. Narayana, S.V., & Dr. Ramu, M. (2018). Study On Organisation Culture of Apple Company. International Journal of Pure and Applied Mathematics, 120(5), 3797-3808. Ott, R. L., & Longnecker, M. T. (2015). An introduction to statistical methods and data analysis. Nelson Education. Paik, Y., & Zhu, F. (2016). The impact of patent wars on firm strategy: evidence from the global smartphone industry. Organization Science, 27(6), 1397-1416. Payne, B. (2017). Brand Positioning and its Usefulness for Brand Management: the Case of Apple Inc. Newcastle Business School Student Journal, 1(1), 51-57. Rani, H. M. N. S., Zuber, F., Yusoof, M., Zamziba, M., & Toriry, S. (2016). Managing Cross-Cultural Environment in Samsung Company: Strategy in Global Business. International Journal of Academic Research in Business and Social Sciences, 6(11), 605-613. Seo, D. (2016). The Commerce Strategy towards Pan-European Innovation and Consumption: Spokes Partnership for FDI of Korea. Journal of Internet Banking and Commerce, 21(S2), 1. Siddiqui, I., & Mishra, U. M. (2016). A Study of Consumer Buying Behavior in Organized Retail Sector: Electronic Industry (Samsung Televisions). International Journal of Engineering and Management Research (IJEMR), 6(2), 401-406. Thuries, S., & Gillet, A. (2016). U.S. Patent No. 9,400,906. Washington, DC: U.S. Patent and Trademark Office. Tulung, J. E. (2017). Resource Availability and Firm’s International Strategy as Key Determinants Of Entry Mode Choice. Jurnal Aplikasi Manajemen, 15(1), 160-168. Watson IV, G. F., Weaven, S., Perkins, H., Sardana, D., & Palmatier, R. W. (2018). International market entry strategies: Relational, digital, and hybrid approaches. Journal of International Marketing, 26(1), 30-60. Weaver, P., Jansen, L., Van Grootveld, G., Van Spiegel, E., & Vergragt, P. (2017). Sustainable technology development. Routledge. Zhang, Q. (2017). Research on Apple Inc’s Current Developing Conditions. Open Journal of Business and Management, 6(01), 39. Zhang, Y. (2015). The impact of brand image on consumer behavior: a literature review. Open journal of business and management, 3(1).